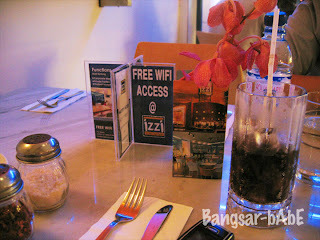 Izzi is having a 50% discount for every RM 50 spent on their food which was a good excuse to pay them a visit. rif picked me up after he finished work and we popped by Izzi at Damansara Uptown. 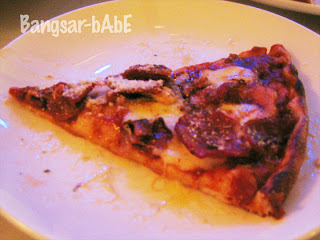 We ordered the Fettucini Con Funghi and a large Beef ‘n Izzi pizza to share. The fettucini was quite good. 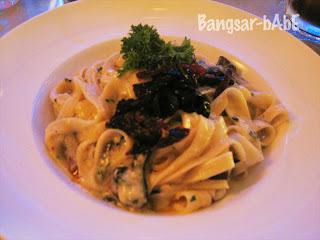 Cooked al dente, it came with juicy, tender mushrooms in a delectable cream sauce. My only gripe was the tiny amount of mushrooms versus the pasta. Our bill came up to RM 39.85 with 5% tax and 50% discount. The discount ends on the 31st January 2008 and is only applicable to food and dessert. 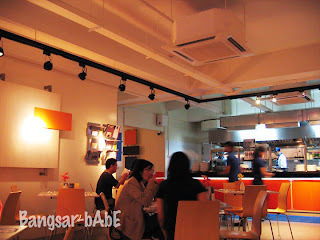 Verdict: Pretty decent food with average pricing (without the 50% discount). I don’t like the blue lights…I found it too disco-ish. Well i thought the food was ORDINARY. Price was so-so. 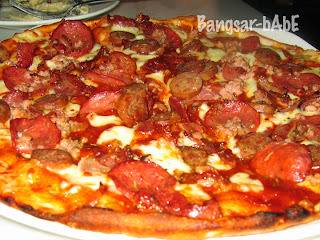 The pizza was something different from your usual pizzahut or dominos, but I would rather eat dominos as it tastes nicer and cost cheaper (with or without the discount).